Cliftonville striker Rory Donnelly’s suspension has been reduced to six weeks following an Irish Football Association Appeal Board meeting on Wednesday night. Donnelly’s charge relates to a breach of regulations regarding “behaviour that damages or could damage the integrity of matches and competitions”. 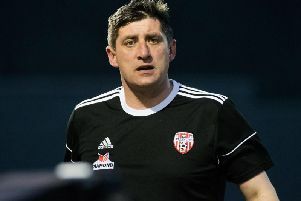 He was handed a three-month suspension as punishment for a message the player sent on WhatsApp about Cliftonville’s team selection before their final match of the Danske Bank Premiership season against Linfield on April 28. Cliftonville felt the punishment was harsh and raised the matter with the Irish FA Appeals Board. On Wednesday night, a statement issued by the Irish FA said: “The Irish Football Association’s Appeal Board this evening considered an appeal by Rory Donnelly (Cliftonville FC) against the sanction imposed by the IFA Disciplinary Committee in the matter of the match Linfield v Cliftonville on 28 April 2018. “The board concluded that the mitigating actions of Cliftonville FC on the day in question were such that the original sanction should be reduced.